Home > Notre actualité > MARKO is Back ! EXCELO, a subsidiary of the Anouar Invest holding company, and a major player in biscuits in Morocco, is re-entering the chocolate bars segment by reviving Marko, a brand that has been very successful ! 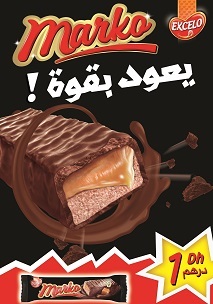 Marko is a delicious bar of nougat accompanied by a tasty caramel, coated with cocoa, at 1dh only. Taste Marko as soon as possible and discover his taste for a intense sweetness !